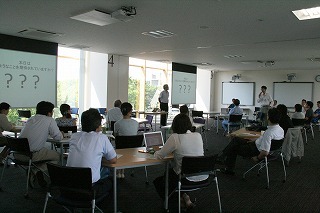 On Friday, July 19, Mie University Faculty Development Lecture was held aiming for the improvement and advancement of the contents and teaching method, at Environmental and Informational Plattform (MEIPL Building). This FD "Teaching in English" is hosted by the Center for International Education and Research (CIER) , Higher Education Development Center (HEDC) and the Committee of the Education, for faculty members of Mie University, who are interesting in giving their lectures in English. In the Lecture, Assoc. 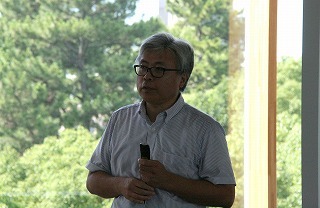 Prof. Shigeru Sasajima, Saitama Medical University, talked about CLIL (Content and Language Integrated Learning), and explained the method and the meaning as well as the effectivity. CLILrefers to a developmental and educational approach taught through a foreign language with integrated education of languages and subjects. In the lecture, he talked about the specific methods, showing videos of lectures which were used in the practical situations. The explanation was very concrete, the 20 participants concentrated in the lecure, taking notes and asking questions. In cooperation with Prof. Sasajima, it was a magnificant lecture which leads us to the prospective development in the future education of English.